The Sandokai is the work of Master Sekito Kisen (in Chinese: Shítóu Xīqiān) who was born in in southern China in 700 AD and died in 790 AD. This was an era in which Zen grew in popularity and began to emerge as a distinct school with many strong, dynamic personalities like Bodhidharma and Eno. 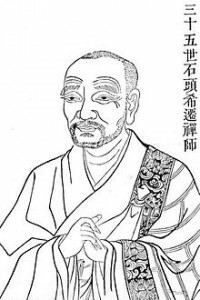 However there were also disputes especially between the Northern school of Zen which emphasised a step by step, contemplative practice, and the Southern school which taught sudden awakening. Few facts are known about Sekito’s life. It is said that at the age of sixteen he was ordained as a monk by the sixth patriarch, Eno. Eno had numerous disciples of which the most important were Seigen and Nangaku. From these two evolved the two schools, Soto and Rinzai. Sekito eventually studied with Seigen and it was from him that he received dharma transmission. The name Sekito means “stone head” and derives from his doing zazen on a rocky ledge where he practised continuously day and night with great determination. San: the idea of difference, duality,phenomena, existences – shiki (thesis). eg. Mountains and rivers, parents and children, satori and illusions, life and death, existence and non-existence. Do: the idea of identity, origin, the void, essence – ku (antithesis). San and Do are both necessary for equilibrium, harmony. Intimately blended they realise the Middle Way. San enters Do, Do enters San: that is Kai. So, Sandokai means the harmony of phenomena and essence. Why did Sekito write it? It alludes to the split between the Northern and Southern schools as well as other dichotomies eg. one and many, light and dark, sameness and difference. It was also customary for a zen master as he neared the end of his life to sum up his life’s teaching in a testamentary poem. The Sandokai is very important in the Soto Zen tradition. It is chanted every day in Soto Zen temples throughout the world. Chikudo daisen no shin, tōzai mitsu ni aifu su. Ninkon ni ridon ari, dō ni namboku no so nashi. Reigen myō ni kō ket-tari, shiha an ni ruchū su. Ji o shū suru mo moto kore mayoi, ri ni kanō mo mata satori ni arazu. Mon mon is-sai no kyō, ego to fu ego to. Eshite sarani ai wataru, shikarazareba kurai ni yot-te jū su. Shiki moto shitsu zō o kotoni shi, shō moto rak-ku o koto ni su. An wa jōchū no koto ni kanai, mei wa seidaku no ku o wakatsu. Shidai no shō onozukara fukusu, kono sono haha o uru ga gotoshi. Hi wa nes-shi, kaze wa dōyō, mizu wa uru oi, chi wa kengo. Manako wa iro, mimi wa onjō, hana wa ka, shita wa kanso. Shikamo ichi ichi no hō ni oite, ne ni yot-te habunpu su. Honmatsu subekaraku shū ni kisubeshi, sompi sono go o mochiyu. Meichū ni atat-te an ari, ansō o mot-te ō koto nakare. Anchū ni atat-te mei ari, meisō o mot-te miru koto nakare. Meian ono ono aitai shite, hisuru ni zengo no ayumi no gotoshi. Banmotsu onozukara kō ari, masani yō to sho to o iu beshi. Jison sureba kangai gas-shi, riōzureba sempo sasō. Koto o ukete wa subekaraku shū o e subeshi, mizukara kiku o ris-suru koto nakare. Sokumoku dō o e sezumba, ashi o hakobu mo izukunzo michi o shiran. Ayumi o susumureba gonnon ni arazu, mayōte senga no ko o hedas-. Tsutsushinde san gen no hito ni mōsu, kōin munashiku wataru koto nakare.